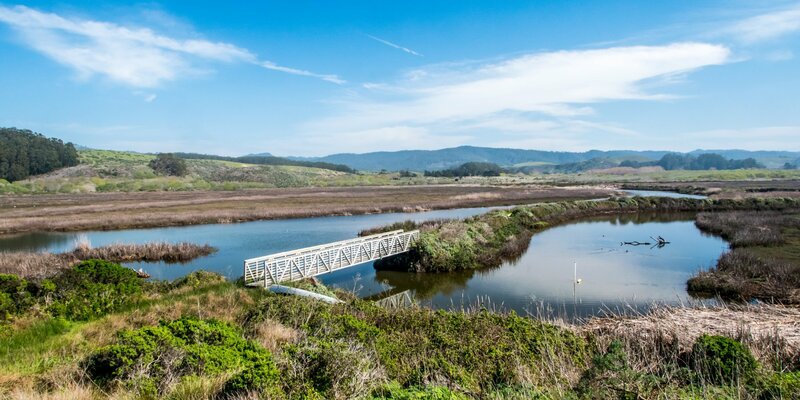 Pescadero Marsh Natural Preserve is a special place with a very high level of community, public agency, and NGO interest in its management. Home to many state and federally listed threatened and endangered species, resource management for the marsh can also have direct implications for the adjacent community that was built in its floodplain in the early 1800s. Historic land use in the watershed, including logging and channelizing creeks, road construction, agriculture, and development (including a town in the floodplain) dramatically increased the volume of sediment entering the marsh. Routine dredging in the marsh and along Butano Creek historically conducted by local farmers ended when the State of California acquired the marsh and lagoon in 1974 as a natural preserve, along with environmental regulations, notably: Endangered Species Act (1973), Clean Water Act (1977), and California Coastal Act (1976). Lower Butano Creek, where it runs through the marsh, has completely filled in with sediment. This blocks threatened steelhead trout and endangered coho salmon from the entire Butano watershed for spawning, rearing their young, and finding critical refuge during storms and droughts. In addition, annual mass deaths of steelhead in the marsh from poor water quality have garnered significant media attention, even as far away as the Washington Post. Chronic flooding of the main road into Pescadero cuts the community off from emergency services and the primary access to State Highway 1. There used to be 14 feet of clearance under the bridge. Now a sediment filled channel exacerbates flooding and road closures. In addition to safety and emergency response, this severely impairs commercial activity in town. Even the perception that the road may be closed deters people from coming to town, resulting in economic impacts. The RCD has been working for years to find solutions to these problems, engaging engineers, scientists, community members, and representatives from a number of different agencies. In 2017, the RCD was awarded funding to re-establish 8,000 feet of the historic creek channel, remove 45,000 cubic yards of sediment, and re-use the dredge material to fill historic human-made pits to restore 28 acres of degraded marsh. Restore access to 10.1 miles of Butano Creek for threatened steelhead trout and endangered coho salmon by reestablishing unimpeded fish passage for a decade or more. Reduce risk to the community associated with flooding at Pescadero Creek Road by reducing the extent, duration and frequency of flooding. reducing anoxic conditions by preventing percolation and movement or freshwater from Butano Creek through and across the marsh. Improve or create habitat for freshwater marsh species (e.g. California red legged frogs and San Francisco garter snakes) from beneficial re-use of dredge material. reduce opportunities for fish to seek refuge in areas of poor water quality. Provide critical data to inform ecological restoration of the marsh. Restore habitat for all marsh species. Remove the community from the floodplain or eliminate flooding to the community. Address any flooding from Pescadero Creek. Eliminate all flooding from Butano Creek. To accomplish these goals, the project will excavate and dredge as needed to re-establish 8,000 feet of the historic creek channel, remove 45,000 cubic yards of sediment, and re-use the dredge material to fill historic human-made pits to restore 28 acres of degraded marsh. For more details about the status of each project task and a detailed project schedule, review this GANTT chart.